The Spousal Unit and I have always enjoyed watching Les Stroud's Survivorman series, so when I spotted this book last Christmas, I knew it would make the perfect unexpected gift for a man who reads mainly fishing magazines. Perfect because I was to keen to read it too. 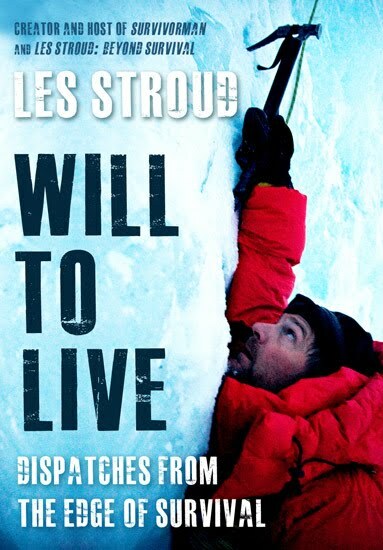 In Will to Live, Stroud deconstructs stories of survival and analyses them, grading the survivors on their preparedness in terms of their knowledge, their dumb luck, the completeness of their supply kit, and their sheer determination. In the course of the book, he reconstructs some very famous cases of survival (the 1972 crash in the Andes of a plane carrying a team of Uruguayan rugby players) and lesser known, but equally riveting stories (Antarctic explorer Douglas Mawson's hellish three month trek). Stroud looks at the actions and inactions of the survivors to determine what they did right and what they did wrong, in determining their own survival and that of others in their party. Stroud is very judgmental in his analysis, and to be fair, some of the people were remarkably ill-prepared and naive. The story that struck particularly close to home was that of the young couple and their infant who set off to drive to a funeral across the Donner Pass (of all places) in a late December blizzard. When storm conditions closed the pass, they chose to take a lesser travelled road, despite not even having winter boots with them, and inevitably became stranded in a wilderness park. Stroud was particularly harsh in his evaluation of their foolhardiness, but it did serve to make me think twice about what supplies I keep in the urban assault vehicle (pitifully few). These stories are utterly riveting. The resilience and the McGuyverism displayed by some of those depicted in these tales are truly inspiring. I don't think that I am any more capable of being one of those who push through to survival at all costs after reading Will to Live, but I am definitely very grateful that I have never had to test myself this way. These tales of survival are interspersed with stories from Les Stroud's own experiences as someone who makes his living and has established his reputation as being a survival expert. I was somewhat disappointed to learn, in the acknowledgements, that Stroud employed a ghostwriter, Mike Vlessides, to research and help write the stories. But at least he was honest about it. This is a fascinating book, peopled with individuals who have overcome seemingly insurmountable odds. Definitely recommended. Sounds like a good book for me to pick up for you brother. Perhaps Les Stroud understands that his forte is survival activities/criticisms not writing, which could explain why he employed a ghost writer. I think Bruno would really enjoy this, Kathy. Good thinking. Stroud claims to have been too busy with television series (he was involved in Shark Week at the time) to do all the work himself, which seems quite plausible. I always love when you get a gift for someone, but can enjoy it too. Wrong? Perhaps. I should enforce this rule with the Boy. As sadly I don't think I'll ever develop an interest in collectible comic book toys, or whatever you call them. I saw him on The Hour once and he was really interesting. He described how to make your pee drinkable using a piece of plastic wrap. While the subject matter is interesting, I think the soft-hearted part of me would have a really hard time not being defensive of those he was analyzing and critiquing. May someone never dissect me and my actions in my weakest hours. Ha! That reminds me of the Christmas that the Brother Unit bought everybody in the family a Dinkytoy car. Seeing as he has nothing but sisters, I think he considered it the best Christmas ever. I think I know how to do that, WC! He actually described a similar concept in the story of a family who was lost at sea in a life boat, who used plastic to make sea water drinkable. I would never judge you, Lesleyif we were stranded in the Antarctic together and didn't want to eat our dogs or our dead companion. Not a big fan of Survivorman (let's face it, you're not really roughing it if you have a well-fed camera crew inches from your face), but this looks like a must-read. Does he cover Wagner Dodge's escape fire? That's my favourite survival story. HA! He's sneaky that way, Kathy. Although it is sort of comforting to know he is still up to his old tricks. He doesn't cover that story, SME, and I am unfamiliar with it, so will have to look it up. But does Stroud not claim to film all of Survivorman himself and that he has no camera crew? That was my understanding anyway. But I always shake my head of Man Tracker because they obviously have a camera crew and yet Man Tracker can't find them? Come on! I should say I suspect he has a camera crew. Maaaaybe he doesn't. Maybe. I saw The Way Back tonight and thought it seemed a little wonky. Walking across the Gobi and the Himalayas to escape Sibera? Srsly? And it turns out the "true story" was debunked by the BBC several years ago. Some survival stories are just a little too good to be true. I don't know that story, SME. Another one I will have to look up, you are keeping me busy!